A landslide, also known as a landslip, is a form of mass wasting that includes a wide range of ground movements, such as rockfalls, deep failure of slopes, and shallow debris flows. Although the action of gravity is the primary driving force for a landslide to occur, there are other contributing factors affecting the original slope stability. A landslide is the movement of rock, debris or earth down a slope. Landslides can be triggered by natural causes or by human activity. Pinnawala Elephant Orphanage is captive breeding ground for wild Asian elephants originally founded in order to afford care and protection to many of the orphaned unweaned wild elephants found wandering in and near the forests of Sri Lanka. It is in Kegalle, a district in Sabaragamuwa Province, Sri Lanka. Kankesanthurai is a town with a harbour, of Jaffna District, Northern Province, Sri Lanka. Srilankan Met Office reports that the low pressure area in the Bay of Bengal has intensified in to a depression and now located to about 400km north of Kankesanturai.It is further moving away from the island. Hence, rainy weather prevailed over northern part of the island will be reduced. However, there is a high possibility to sudden increase of rain in the South-western part of the country and strong windy conditions over the country and in the sea areas around the island will continue during next few days due to meeting of wind feeding to the system. The Office added that there may be temporary localized strong winds during thundershowers. That is bad news for Lankans, affected by severe rains in Colombo after 18 years. Some reports state that due to unprecedented rainfalll this week, over 300,000 people in seven districts have been badly inconvenienced. BBC and local media reports suggest that a record of 440 mm rain was recorded in the city. Many streets were under water. Floodwater was running from 3-4’ above the road level. Many could not get out of the houses they live to go to safe places. The Speaker had to limit the Parliamentary session to just 8 minutes and the Parliamentary complex and surrounding areas have been flooded. 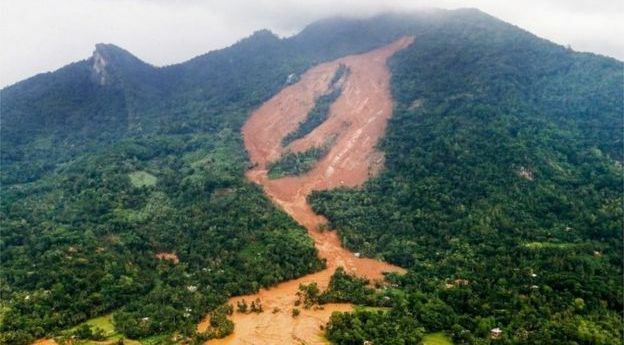 SMH reports that rescuers are looking for more than 200 families who are missing following massive landslides in a remote area on the slopes of Sri Lanka’s Central Hills. Agency reports quoting Red Cross stated that they suspect at least 220 families were missing, going by government population records. Government officials did not confirm the figure. Seventeen bodies had already been recovered from piles of mud, a military spokesman said, taking to 36 the confirmed, countrywide death toll attributed to the severe weather and flooding. It is stated that rescue operations had been hampered because roads leading to the mountainous area north-east of the capital, Colombo, were treacherous. The operations are further hampered by lack of quality equipments. The Disaster Management Centre (DMC) said dozens of houses were destroyed when mountain slopes collapsed, forcing hundreds of villagers to evacuate. The military said dozens of service personnel and eight army officers had been deployed to the rescue area near the town of Aranayaka. “This is the worst torrential rain we have seen since 2010,” said a DMC spokesman. Nineteen of Sri Lanka’s 25 districts have been hit. Flooded roads and fallen trees led to traffic jams in Colombo. Trains were halted as water submerged railway tracks, officials said. Flooding and drought are cyclical in Sri Lanka, which is battered by a southern monsoon between May and September, while a north-eastern monsoon runs from December to February. Landslide that has caused devastation is insurable. In Australia, the standard homeowner policy will not cover damage caused by land movement or a landslide due to: rain runoff, snowmelt, flooding and earthquakes. There are add-on covers that provide protection. Back home in India, the Standard Fire & Special perils Policy names ‘ Subsidence, Landslide and Rock slide ’ as one among the perils named. Destruction or damage caused to the property by subsidence is covered. The coastal or river erosion, erosion of soil etc. are not covered. Claims attributable to improper or faulty design or defective work of construction will not be within the purview of insurance policy.